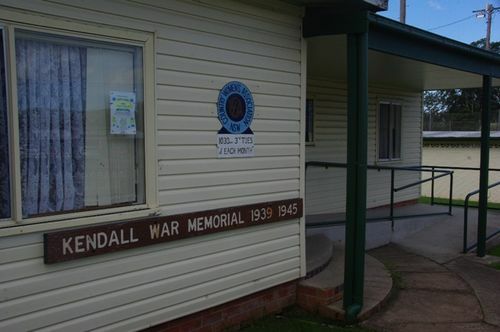 Kendall War Memorial Hall was erected in memory of those who served in World War Two. It is expected that a start will be made with the construction of the Kendall War Memorial Community Centre this year. At a special meeting of the Committee on Monday night, it was decided to obtain plans and specifications from the architect for submission to Hastings Shire Council. The Centre will comprise ex Servicemen's clubroom, Baby Health Centre, and Red Cross committee room. In addition to most generous donations of timber, the committee has more than £1,600 in cash. Much voluntary labour has been offered to assist in the construction of the building. The Centre will be a great asset to the Kendall district. The Northern Champion (Taree, NSW), 8 April 1953.